Like many others, Vince decided to move to Riverwest in search of affordable rent. He had lived on the East Side for nearly a decade after graduating from UWM in 1970 and moved in search of not only cheap rent, but change as well. It wasn’t long after moving that he realized the Riverwest neighborhood was the place for him and he has lived in the same house on Bremen south of Locust Street ever since. Born and raised in Racine, Vince attended Catholic schools and worked at his father’s silk-screening shop. Although he lived further from school than most kids, he enjoyed having a sense of community in his early childhood years. In order to continue his education and pursue his love of plants and animals, Vince decided in 1966 that it would be best to head to Milwaukee and study for a degree in conservation with a focus on botany. While in college, having received a deferment from the Vietnam War, he became exposed to and learned a lot about political issues as well as the natural systems of life. After he graduated from college the economy was struggling to rebound and Vince set out to find a paying job. Eventually landing in a camera store downtown, Vince was hired as the store manager. After a while he transitioned into work as a traveling photographer for southeastern Wisconsin schools. He estimates that over the years he took pictures of more than 30,000 kids. He soon became involved with the East Side Housing Action Committee (ESHAC), a housing action and community revitalization group in Riverwest. While serving on the Board of Directors Vince helped write news articles and take photographs for their newspaper, the East Side News. He also gained a great deal of knowledge about board service, political issues surrounding community revitalization, and most importantly – what not to do. Through strategic planning, Vince learned to look at things in a more structured way in order to develop an understanding of issues and establish action steps. He also continued to learn about many aspects of community and government processes. In 1999 Vince completed and published the Riverwest Neighborhood Strategic Plan for 2000-2004. This laid the groundwork for almost everything he has worked on in the Riverwest community. He decided that in order to be able to accomplish any of the goals in the strategic plan he would need to break free of the political chains that surround working in a nonprofit organization. Thus, he had no choice but to quit his job and move full steam ahead. 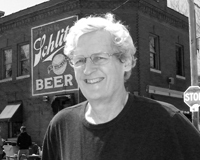 He has played an influential and lasting role in the Riverwest Co-op, the Riverwest Neighborhood Association, the Riverwest Currents, the Beerline Trail paved path, and Garden Park. It wasn’t always easy, but in the case of Garden Park, it was the decision to proceed until apprehended that made the ownerless lot the asset it is today. Riverwest to get involved in community, environment, and because it’s an all-around great place to live. Vince embodies a genuinely positive spirit that has focused on being a good citizen by caring about this neighborhood and the people in it. While he doesn’t see himself as an organizer or activist, he’s willing to accept that people who know him may think otherwise. As he turns 65 in May of 2013, he envisions himself transitioning from a leadership role into more of a facilitator role and working to help people communicate effectively with one another. Vince currently works for the River Revitalization Foundation leading college students, volunteers, and just about anyone interested on hikes along the river. Though he has been struggling with mobility issues, he is recovering from hip replacement surgery as this article is published. He has been managing to get around and loves to take students out along the river to forge a vital human relationship to nature. For Vince, the river is the lifeblood of the community, and will forever be the “Riverwest current”. When he reflects on his history in Riverwest, his fondest memory is from thirty years ago when he and his partner, Paula, were enjoying their morning cup of coffee and reading the paper. They heard a band playing outside and decided to go see what was going on. They found themselves swept up in a parade. After that the two of them helped organize and run the Gordon Park Fourth of July Celebration for twenty years. That’s how he got involved with the neighborhood: a little bit of curiosity mixed with a lot of ambition to be part of a community he could never dream of leaving. Vince is a wealth of knowledge and maintains all of the newsletter and newspaper archives on the neighborhood. With any luck, someday he will decide to sit down and write a book on his experiences and Riverwest. Until then.